Having access to one of the fastest versions of the GeForce GTX 1080 Ti in the world, the US overclocker K | ngp | n this week installed an engineering sample of the Core i9-7960X processor with sixteen cores on the EVGA X299 Dark motherboard, which was cooled with liquid nitrogen. 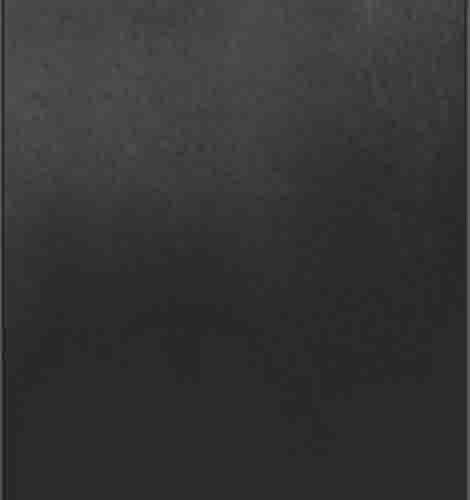 In the illustration to the experiment, we can also see a device for removing the cover from the processor, but nothing is said in the description of the replacement of the standard thermal interface. 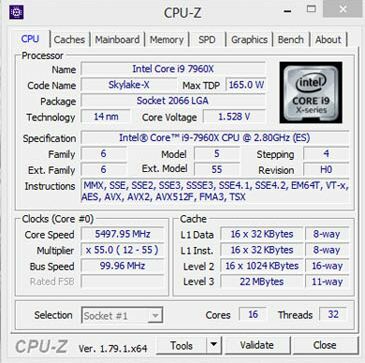 While we will assume that the processor has not been modified, and the achieved frequency of 5.5 GHz is not the limit. Along the frequency of 2581/12856 MHz, the EVGA GeForce GTX 1080 Ti video card was called "Vince Lucido", it was also cooled by liquid nitrogen. All this allowed to score in the 3DMark Fire Strike 35 755 points, updating the record for single video cards. In the 3DMark Fire Strike Extreme test, the score was 19,616 points, and the video card frequencies were increased to 2607/13008 MHz. I would like to note the appearance of Atom C3000 processors . In addition, we will not miss the opportunity to recall that the Core i9-7920X processor with 12 cores in Intel's price list has been around for a long time, but it will not be available until August 28th. The situation is not quite normal, and it only emphasizes that the announcement of AMD Ryzen Threadripper forced the competitor to violate their own traditions. The Atom C3000 processors, of course, are not designed for consumer systems, and they will not be able to buy them separately from the motherboard, so the prices serve as guidelines for potential Intel customers. August was traditionally rich in Intel's processor premieres, so this change will not be limited to the current month, but we will devote a separate material to other surprises of the document under study. Analysts at Semico Research published a report on the state of memory manufacturers and expressed concern over the growing tensions around North Korea. There may not be a conflict, but two-thirds of the plants producing the DRAM and NAND-like memory needed by the world were in the risk zone. About 70% of the world's memory production is concentrated in South Korea. These are the factories of Samsung and SK Hynix. 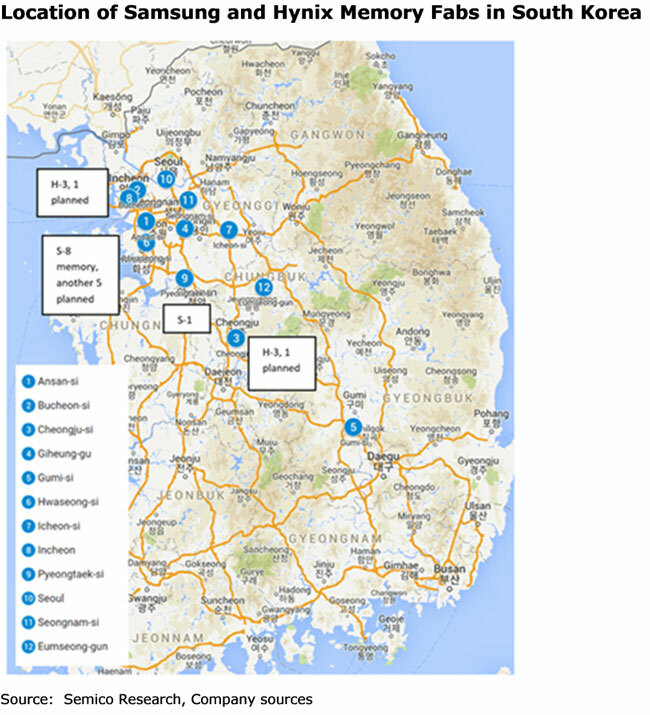 In the picture below you can see the locations of the plants Samsung (S) and SK Hynix (H) with the decoding operating number and under construction lines (factories) of companies. All of them are in the zone of destruction by conventional artillery from North Korea. In the event of a conflict, all this can be destroyed overnight with catastrophic consequences for the global economy as a whole. Political instability in the region can further heat up the rising selling prices for memory. 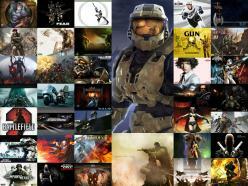 Analysts gave a detailed analysis of the situation on the market and separately by producers. The growth of average selling prices began in June 2016 . 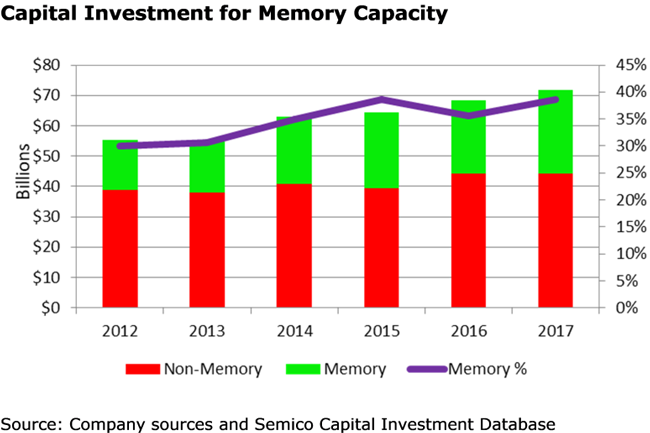 Manufacturers have begun to better control investments in memory production, and the amount of memory per device has grown. 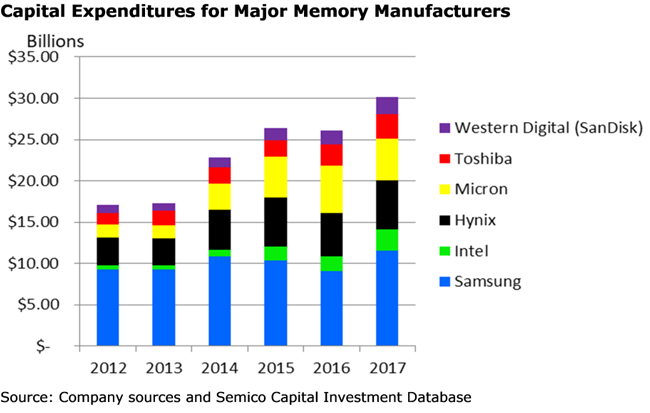 From 2012 to 2016 (except for the failure in 2015), the capital expenditures for memory production grew stronger than the cost of producing the remaining semiconductors. Closer by 2016, capital expenditures began to be invested not in the expansion of the lines for the embedded production processes, but in the production line with advanced technological standards, which required an increased number of cycles for processing each plate (multiple projection, etc.). To a large extent this involved moving to the production of 3D NAND multilayer memory. The introduction of 3D NAND production required colossal costs. 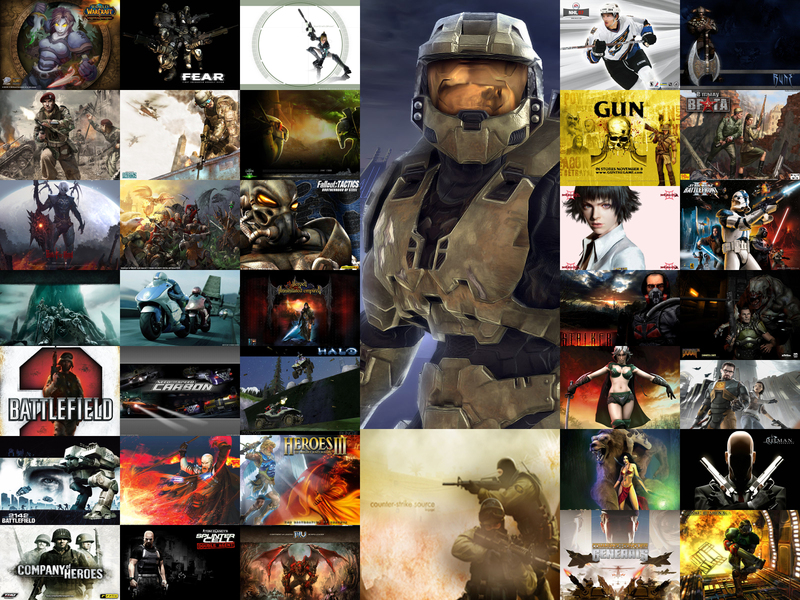 In 2012, only 30% of the annual capital expenditure was spent on memory production. In the next three years, this percentage will rise to a peak of 39% in 2015. In 2016, the percentage of memory outlays dropped to 36% and in 2017 again promises to jump to 39%. In different years, each of the companies varied the amount of funds that were allocated for the modernization and extension of the lines. So, in 2012 Samsung for these purposes (for memory) postponed 56% capex (and then first began to produce 3D NAND). In 2016, Samsung released for memory much less - 37% of the funds for capital expenditures. The second after Samsung in terms of capital costs for memory production in 2012 was the company SK Hynix. For this purpose, it spent 20.3% of the allocated funds. In 2016, it dropped to third place with a cap on DRAM and NAND at 21.6%. Together, Samsung and SK Hynix spent 76% of their capital expenditures and 58.8% in 2016 on memory production in 2012. From 2012 to 2016, Micron, Toshiba, Intel and Western Digital (SanDisk) also increased their costs for memory production. Intel company was the most powerful in this period - on average by 29% per year, because it had the smallest base for memory release. Intel spending is aimed at the most advanced - for the release of 3D NAND and 3D XPoint. Both these positions can push the sales of processors, so Intel is personally interested in increasing the production of non-volatile memory. The growth of memory costs by Micron was second with 28.7% per year (on average in compound percentages). In 2016, Micron became the second capital expenditure, but in 2017 will again give second place to SK Hynix. The average annual growth in SK Hynix's capex for the memory from 2012 to 2016 was modest - by 9.4% per year, but in 2017 the company's expenses for memory will fall into the range of 19-24%. Toshiba and WD (SanDisk) spent an average of 13.7% and 12.3% for the period from 2012 to 2016, respectively (all these data can be seen graphically below, all the information, recall, provided by the company Semico Research) . Let's notice, on the schedule there are no Chinese manufacturers. In China over the past year, the construction of three mega-factories for the production of DRAM and 3D NAND has begun. While this is not an ace in the sleeve, but only a joker. Plants in China will start operating in 2018 and in 2019. At full capacity, they will be out by 2022-2025. That's when the fun begins. It seems that now memory manufacturers are trying to collect all the cream from the memory market, and then at least the grass does not grow. Undoubtedly, memory manufacturers' revenue growth is due to an increase in the average memory sales price. The ASP (average selling prices) was the lowest in June 2016. By the end of 2016, the ASP value for DRAM increased by 30.8%. The ASP value of NAND memory for the same time increased by 44.2%. In 2017, these trends continued to develop. To date, ASP DRAM has increased by another 47.2%, and ASP NAND has grown by 20.6%. In addition to the lack of actions and plans to expand the lines for memory production, the lengthening of production cycles and, as a consequence, a decrease in the number of plates processed per month became a negative factor. With the release of Radeon RX Vega video cards, the market for occasions for news has become no less, and this is frankly encouraging, since usually after the publication of reviews, profile topics go deep into conferences. 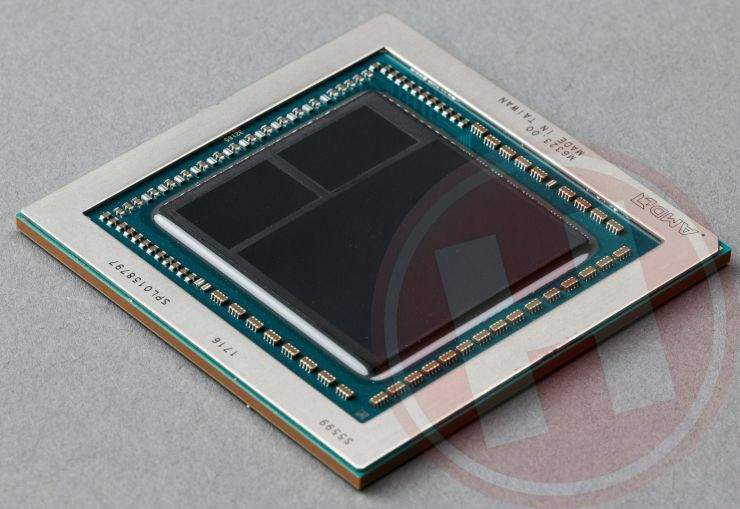 Dutch colleagues from the site Hardware.Info when studying the Radeon RX Vega 64 graphics processors Vega 10 with HBM2 memory attached to the samples managed to find out that some instances have differences in the technological packaging. 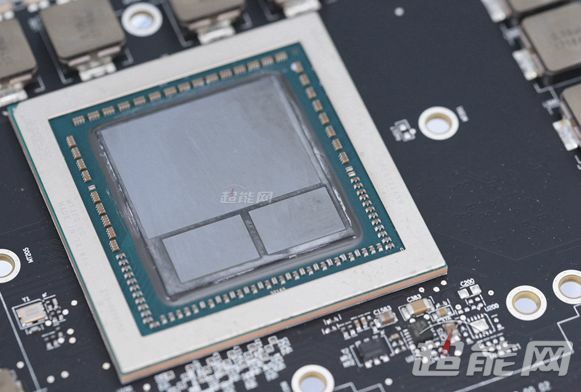 The first embodiment does not provide for "pouring" around and between the HBM2 chips and the GPU chip. 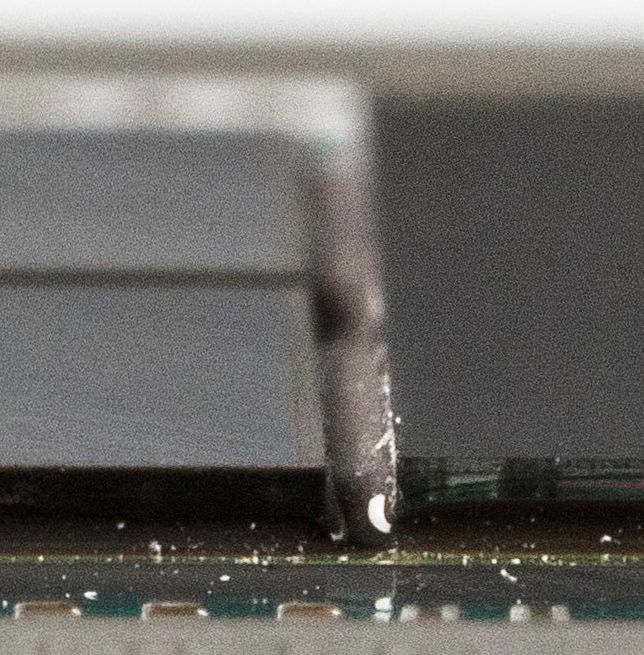 Moreover, the GPU chip slightly rises above the surface of the HBM2 memory chips, forming a small step. At the same time, the second version of Vega 10 not only provides for "filling" with a special composition of the gaps between the memory chips and the graphics processor, but also the space around them, but also excludes such a difference in altitude. Absolutely flat surface greatly simplifies the installation of the cooling system, since the heatsink bottom can be made flat. 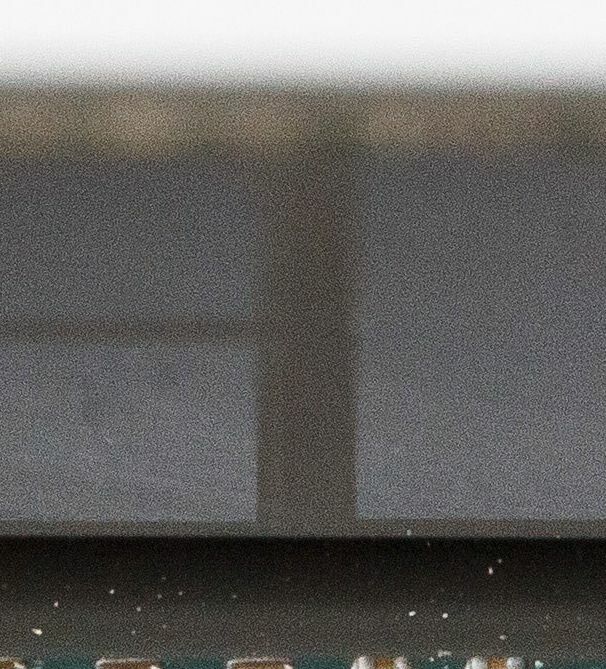 The "ledge" will also worsen the contact with the memory chips, as they will be remote from the bottom of the cooler. 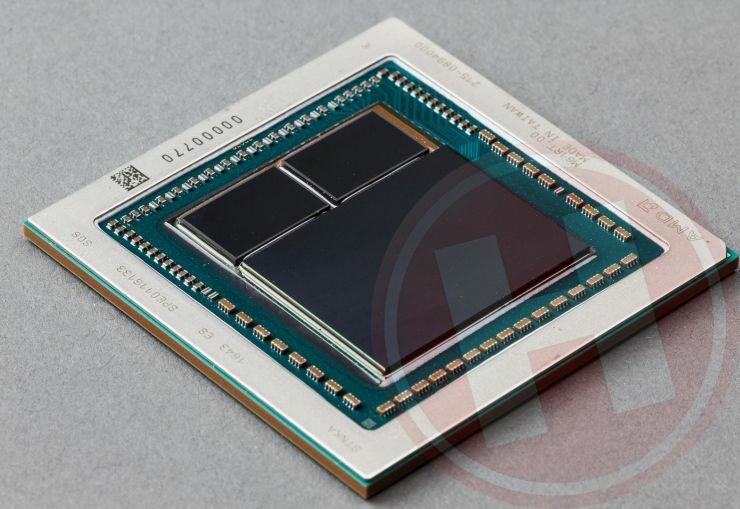 Some video card manufacturers admitted in an interview to our Dutch colleagues that two different AMD contractors are engaged in packing Vega 10 crystals and HBM2 chips, hence the differences between GPU instances. The manufacturers of video cards will compensate for the difference in heights with additional quantity of thermal interface or thermal pads, but this will not rule out the heterogeneity of the thermal characteristics of video cards. 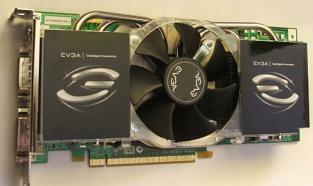 By the way, the differences in packaging are inherent not only to the samples of Vega 10 separated from the printed circuit board, but also to commodity video cards. Page loaded in 0.321 seconds.